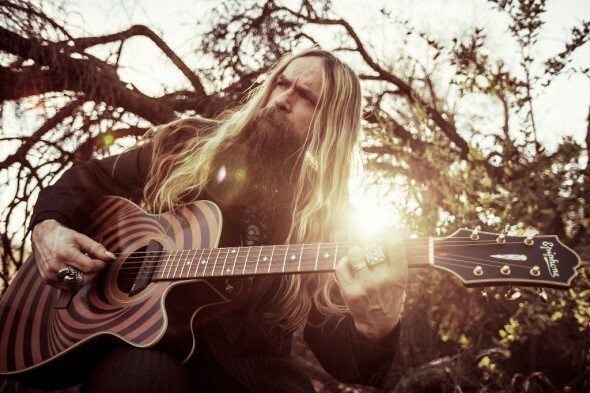 February 25, 2016 — Guitar icon ZAKK WYLDE today has debuted an all new single titled “Sleeping Dogs” from his forthcoming solo LP. Artwork, created by Wylde and longtime collaborator John Irwin, is being revealed today along with 14-song tracklisting. “Sleeping Dogs” will also be available as an iTunes instant gratification track, meaning fans who pre order the album on iTunes will get the single immediately. An additional pre order bundle is also available offering a Book Of Shadows II CD signed by Zakk plus a 17″x11″ poster. Limited to 1,000 bundles. Zakk Wylde will release Book Of Shadows II on April 8th, 2016 via Entertainment One Music (eOne Music), his first solo release in 20 years. This release is the highly anticipated follow up to 1996’s Book of Shadows LP, a classic album Wylde released between his work with Ozzy Osbourne that has since become a fan favorite. The fearlessly introspective melancholy and melody of Book of Shadows helped to make its follow-up one of Rolling Stone’s Most Anticipated Albums of 2016. As fierce and diverse as his work in Black Label Society and as large as his accomplishments as lead guitarist for Ozzy Osbourne have been, Book of Shadows II offers an even richer look into the spirit and psyche of one of the most beloved pillars of the hard rock community. Brand new tracks like “Sleeping Dogs,” “Tears of December,” “Darkest Hour,” “Harbors of Pity,” and “The King” are bold proclamations of intense feeling and powerful catharsis. Zakk Wylde’s powerful pipes, mayhem-inducing charisma, mischievous humor, and instantly recognizable pinch-harmonic driven blues based histrionic guitar shredding have made him the world’s most beloved American Guitar Hero. Keeping up with his road dog reputation Wylde has accumulated over the decades, he is treating 2016 no differently. Having just wrapped up a successful stint on the 2016 Axes and Anchors Cruise, Wylde wasted no time in announcing his participation in the 2016 Generation Axe Tour featuring Steve Vai, Yngwie Malmsteen, Nuno Bettencourt and Tosin Abasi. Click here for more info. Zakk is currently on tour with The Hendrix Experience Tour featuring some of the biggest names in Rock N Roll celebrating the legacy of Jimi Hendrix.